I first became familiar with the term wildland-urban interface, or WUI (pronounced “WOO-EE”), 10 years ago while I was doing my master’s thesis research on wildfire planning at the Massachusetts Institute of Technology. My classmates and I used the WUI acronym lightheartedly — who doesn’t like dealing with the stress of a thesis through a little planning humor? Little did I know then how urgent the WUI situation was becoming across the country, requiring a planner’s call to action. The WUI is generally described as the area where structures and other human development meets or intermingles with wildland vegetation, such as grasslands, forests, or shrubs. As planners, we think about typical WUIs as suburban and rural areas, but WUIs can exist in a range of urban environments (see figure). 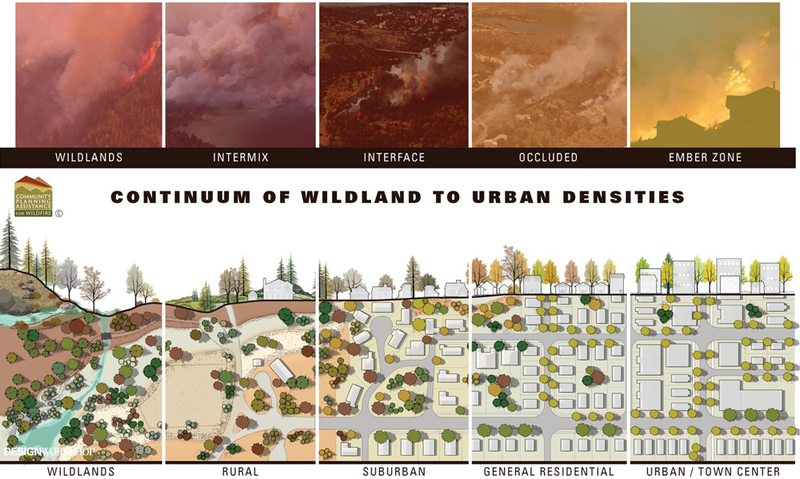 The wildland-urban interface exists along a continuum of wildland to urban densities. Different WUI types can be correlated to development patterns which transition across zones, similar to the transect model. Source: Community Planning Assistance for Wildfire. Researchers at the SILVIS Lab have quantified the WUI based on the presence of vegetation and structure densities to spatially define this concept for the conterminous United States. Based on their calculations, the WUI covers nearly 10 percent of the country’s land area; roughly one-third of the U.S. population (44 million houses) is located in the WUI. Every state in the SILVIS Lab analysis has land classified as WUI — illustrating its relevance as a national planning issue. It’s essential for planners to consider the WUI during the community planning process because it has a direct link to potential wildfire disasters. As more homes and neighborhoods are located in wildfire-prone areas (i.e., the WUI), the greater the likelihood that people and property will be affected during a wildfire event. With an average of 75,000 wildfires occurring annually across the country, it should come as no surprise that more communities are being affected by this natural hazard. Although devastating images from the 2017 California fire season remain fresh, wildfire disasters have also occurred in recent years in WUI areas as diverse as Tennessee, Kansas, Oklahoma, Washington, and Oregon. When the right weather conditions meet an ignition source (human or lightning-caused), wildfires can happen almost anywhere. Fortunately, more opportunities are emerging for communities and planners to engage in effective WUI planning solutions. For example, the Community Planning Assistance for Wildfire (CPAW) program — a national program funded by the USDA Forest Service and other private foundations — helps communities address their WUI through land use planning strategies. Under the program, multidisciplinary teams (planners, foresters, risk modelers, and researchers) provide recommendations to community planners, fire officials, and other stakeholders to improve local WUI plans, policies, and regulations. Spatially defining the WUI and assessing different levels of wildfire hazard to provide decision makers with accurate and defensible hazard data. Updating Comprehensive Plans with information on wildfire history, the ecological role of wildfire, and goals and objectives supporting community wildfire safety and risk reduction. This provides consistency between policies and regulations, and supports future WUI planning activities. Adopting WUI regulations, such as a WUI code, to address key issues including access, water supply, building construction, and landscaping. Linking specialized plans, such as a Community Wildfire Protection Plan or Hazard Mitigation Plan, to the Future Land Use Map to tie development decisions with hazard planning. In addition, FEMA now offers a course on Land Use Planning for the WUI, which focuses on how land use planning can contribute to reducing wildfire risk in the WUI. APA is working on a PAS report, set for publication in 2019, that will be focused on planning the wildland-urban interface and provide new reference material for planning practitioners interested in learning more about the WUI. Finally, for planners attending the 2018 National Planning Conference in New Orleans, join us on Tuesday, April 24, at 10:15–11:30 a.m. for the session “A Team Approach to Wildfire Planning” (NPC188003). Living in the WUI doesn’t predict when an area will be affected by wildfire, but it does show the extent to which our country’s built environment is exposed to this frequently occurring natural hazard. Tackling our country’s WUI situation takes a multi-pronged approach, and planners are an important part of the solution. Top image: Hazardous fuel reduction at the wildland urban interface in 2012, Sherburne National Wildlife Refuge in Minnesota. Photo by Russ Langford, U.S. Fish and Wildlife Service (CC BY 2.0). Molly Mowery, AICP, manages Wildfire Planning International, LLC, a consulting practice dedicated to helping communities address their wildfire threat through effective land use planning strategies.